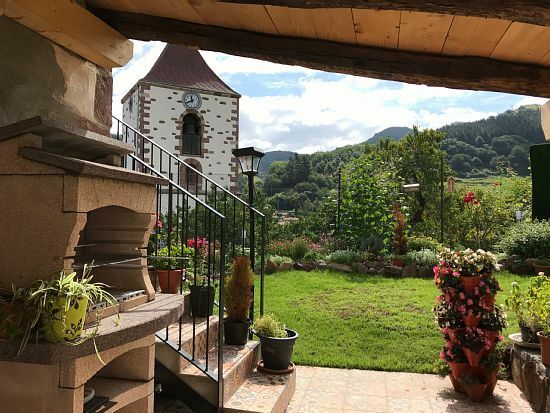 If you want to rest and enjoy nature, culture, gastronomy, a beautiful village in the Navarrese Pyrenees, in a century-old house, classified for its architecture, restored and retaining all its traditional architecture, with a beautiful enclosed garden overlooking the church and the mountain, in the center of town, this is your place. 3 floors with 4 bedrooms, 4 bathrooms with hydromassage showers and a toilet, garden with porch and barbecue. Ground floor, large room with pool, toilet and exit to the garden. First floor kitchen, fully equipped, dining room and fireplace. 2 bedrooms and two bathrooms. Second floor, two bedrooms, two bathrooms, living room and balcony. Ideal for families, group of friends, children. Sunbilla is a beautiful town, with its Medieval bridge and the Bidasoa river that crosses it, giving it a special charm. Beautiful stone houses. Ideal for lovers of nature, hiking, crossed by the greenway, for bicycle lovers. From here we can visit many places of tourist interest, less than half an hour by car, in the mountains, but 20 minutes from the beach. If you want to know the experiences of our customers, look for us in Google Maps. Guaranteed the best quality price of the area. Beautiful typical Basque house over 200 years old, restored this year. Located on the oldest street in the village with a Roman road. Beautiful views. The town square is next to a playground for children. Great room in the lower part with billiards and other games, garden with barbecue, couple Quin in front of the house exclusive for customers. Fui con los amigos a pasar un fin de semana en la casa y la verdad es que lo pasamos genial. La casa es muy grande y está muy bien equipada para grupos grandes (nosotros fuimos 10). El txoko está muy bien con el billar y tiene acceso directo al jardin donde está la barbacoa. Muchos cuartos de baño, por lo que no había ni que esperar apenas cuando volvías de hacer alguna ruta. Active tourism, visits to typical villages, caves, lakes, museums, hiking, landscaping, waterfalls, lakes.